When Canadian Lentils invited me to take part in their Recipe Revelations challenge, I totally jumped at the opportunity. 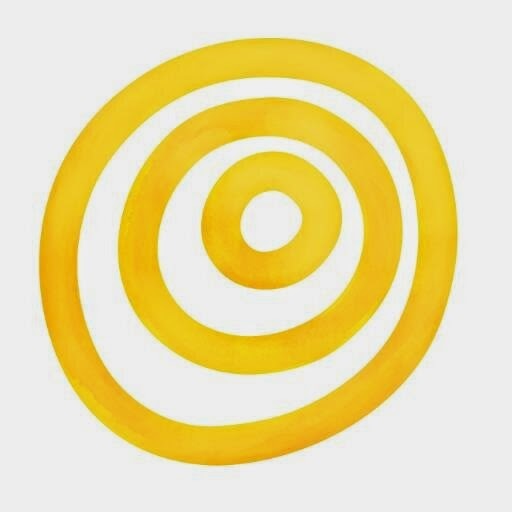 Because, if you all read this blog fairly regularly, you'll know that I have a vegetarian daughter that needs protein. What better way to stuff her full than by using lentils? I cook with lentils pretty frequently. From Masala Dal to Biscuit Ambade, lentils feature at least a couple of times in my kitchen. However, as the challenge required an original recipe, it took me some time to think of something that I hadn't already featured on the blog. It took me a LONG time to recreate the recipe. This recipe is technically original, as I actually have no clue what recipe the chefs at the Bukhara use. My recipe has come about with a lot of trial and error. The first time I made this dish, I didn't cook the lentils enough, and so while the spicing was fine, the lentils were quite crunchy. It tasted OK, but I was desperate to create that soft creaminess that was characteristic of that Bukhara taste. I tried adding cream during the cooking process, but I felt that this just made the lentils a bit slimy. The second time I made it, I varied the spices a bit. Using black cardamom instead of green seemed to add the hint of smokiness that was missing from the first version. This time round, I actually managed to get everything right, including a hint of the original taste, but again, something about the dish seemed to be off. Back to the drawing board, sigh! Then finally, inspiration struck. And of all sources, it was my husband who offered the final piece of the puzzle. We were talking about trying to maybe build a tandoor in the backyard. But then he matter of factly suggested, why not try cooking it in the barbeque? After all those coals pretty much mimic the tandoor at any given time, especially as its a dish that has to go on the top of coals, as opposed to sit inside them, like, say a naan. Yep. That was the key I figured. But unfortunately, cold weather has meant that the use of the barbeque is strictly limited. So I decided to go with an indoor oven instead. I made the dal to the point of it being almost fully cooked, then covered the pot tightly with foil, and I placed it in a low oven for a couple of hours. 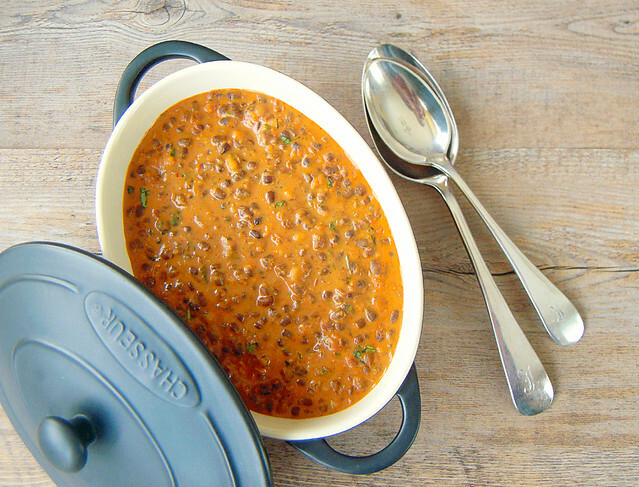 When I opened the dal, after it had sat inside the oven, I was just overwhelmed with the fragrance of the spices! And then I tasted it... oh my... finally... success! The dal didn't have the charry, smoky flavour that a tandoor imparts, but it did have the right combination of spices, and the lentils were just amazing. Melt-in-your-mouth texture, each bite just unleashing a torrent of sensation. I served these with saffron rice (I was too lazy to make naans, but you can, the recipe is here) and I was so very pleased with this recipe. It seemed like all my hard work on developing this recipe had finally paid off, and I was rewarded with a Dal Bukhara that tasted eerily close to the original. Mine wasn't as spicy, as all these years of living in the Western world has taken its toll on my spice tolerance, but the flavour was just completely unbelievable. Plus, this is the ultimate slow cooked, cook ahead dish. The spices completely harmonise if let to sit overnight in a fridge, and its one of those dishes that actually taste better the next day. I urge you to give this dal a go. Chances are, you'll be booking the next flight to India and then complain that the dal at the Bukhara doesn't taste as good as yours :-) Haha! My friend Connie, also known as the Macaron Queen of Edmonton, she of Mirabelle Macarons took some of the amazing pictures for this post. Thank you, love! I am so looking forward to our next adventure together, and there's something special coming from her and me very soon! Soak the black lentils in cold water overnight. The next day, rinse and pick over the lentils, then place them in a large pot along with the cinnamon sticks and the bay leaves, and cover with cold water. Add 1 teaspoon of baking soda (bicarb of soda) to the lentils, and bring to the boil. Boil hard for 5 - 10 minutes, skimming off any scum that rises to the top. Turn down the heat, then simmer, topping up with hot water ocasionally, for between 40 minutes - 1 and half hour. The lentils are cooked when they are soft, but just about holding their shape. Drain, remove the cinnamon and bay leaves, and place back in a pot. To make the spice mix, toss the ingredients in a hot pan, shaking and stirring constantly for about 30 - 45 seconds, until fragrant. Grind them to a fine powder in a spice grinder (or an old coffee grinder) Keep aside. In an oven safe large pot (I use my Le Creuset), heat 1 tablespoon of butter and the oil. Add the onion, and cook for 5 - 8 minutes, until the onion softens, and just begins to colour. Add the garlic and ginger and fry for a minute. Add the tomato paste, the spice mix, garam masala, ground cinnamon and chilli powder, if using, and stir well, using a little hot water to loosen the paste, if its too thick. Cook for about 10 minutes, then add the drained lentils. Stir together, and slowly add the yoghurt, little by little until well incorporated. Cook for about 5 minutes, adding a little more water if the dal is too thick and creamy. Add the salt to taste, and stir the sugar. Cover the pot tightly with foil, and place its lid on top, if it has one. Place in the low oven for 1 - 2 hours. If you're keeping it in longer, turn the oven down to 120 C, then you can keep the pot in it for up to four hours, until ready to serve. To serve, take the pot out of the oven, and stir in the cream, butter and fresh coriander. Adjust the seasoning to your taste again, adding a little more salt if required. Serve with rice, naan or any Indian bread. Note: If you are making this in large quantities for the freezer, take out of the oven, and let it cool completely. Freeze in meal sized portions. You can reheat in the microwave or the hob, once thawed. Do not add the cream/ butter/ cilantro before freezing, you can add it just after reheating. I am bookmarking this to try Michelle and I have everything apart from the star anise. The photos are wonderful. Are they taken outdoors? New recipe to me. It looks so healthy and tasty. Sharmilee, thank you. It was pretty good dal! Chloe, I hope you enjoy it. Its a great recipe. Juan, yes! I always make a lot of this recipe and chuck it in the freezer. It tastes really good reheated. Superb! Loved it and such beautiful pictures, I must bookmark this! OK. I,m your competition, but I give you full credit. I've eaten this soup in New Delhi and loved it. If I get the courage I'll try your version. Good luck to you and to me. 1.There is no salt in this recipe, is that correct? I had to add a little to make it better. 2.There is one tablespoon sugar in the ingedients list but this is not mentioned in the preparation. 3.I always thought that this dal is made with red kidney beans (rajma) as well. Anyway, thanks for great recipe! AZA (Miroslav), thanks for pointing that out. I don't normally use salt in my preparations, because my husband doesn't like it, but I like to include it in the recipe, I must have forgotten to add it to my recipe notes. I am going to add that to the recipe right now. The sugar's added right at the end, thanks for pointing that out too. Will update the recipe. I spent several months travelling through India quite a few years ago. While I was there I ate Dal Bukhara at least every other day. I couldn't get enough of it. I have never been able to find a version as good as the one's I had in India. I can't wait to try your recipe. Thank you for sharing it! 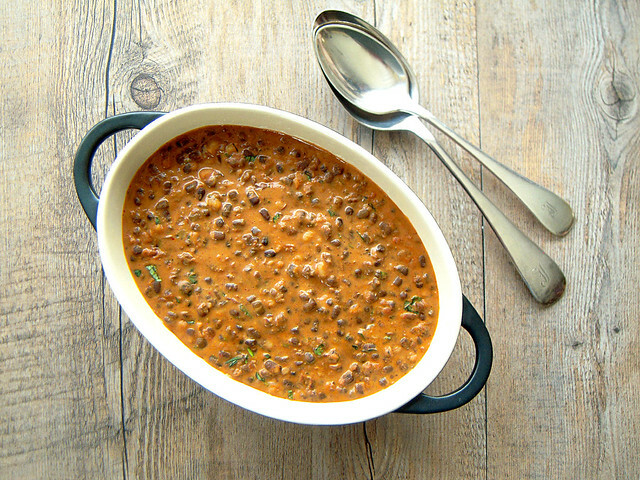 I love dal, can't wait to give your recipe a try. 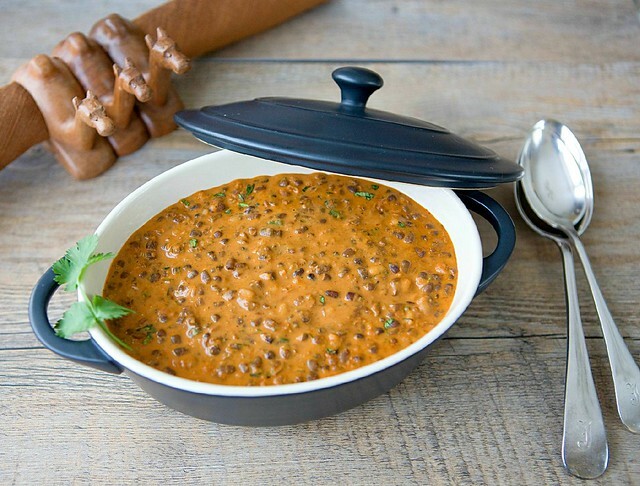 The pictures of your dal look so good and yummi!!! I have heard stories about this lovely dal bhukhara from people who have eaten the real deal. Now I am so excited to see your recipe as this looks perfect!! Can't wait to try it! Wow! I wish I had my own blog to expound the virtues of this dish! Thank you so much - this'll be in regular rotation for sure! This sounds amazing and is going on the menu this week! Beautiful photography as well. I stopped by the FB page for a vote. This is deserving for sure! Thanks for this. I think I've already mentioned (probably more than once) my fascination for the black lentils cooked for 30 hours over charcoal at my local restaurant. I've never tried anything quite like this myself because I know how tricky cooking black lentils can be, so thanks for the guidance. I'm also currently slightly obsessed with the flavour of black cardamom, so this looks good to me. Thank you so much for the lovely comments and votes, everyone, I really appreciate them so much. I am very excited about this challenge, and hopefully I'll make it into the top in at least one category. Touch competition though, so please, if you like this post and this recipe, head over and vote for me. This looks absolutely amazing, I definitely want to try to make this at home. Hi Bryarly, thanks for taking the time to comment. I usually use dried chillies for the spice mix. I feel that toasted whole chillies, when ground up add a lot of flavour. But if you don't find them, then feel free to substitute with 1 - 2 teaspoons of Kashmiri chilli powder. Just remember to use mild chilli powder, otherwise the flavour is too spicy. If using hot chilli powder, reduce to 1/2 teaspoon. 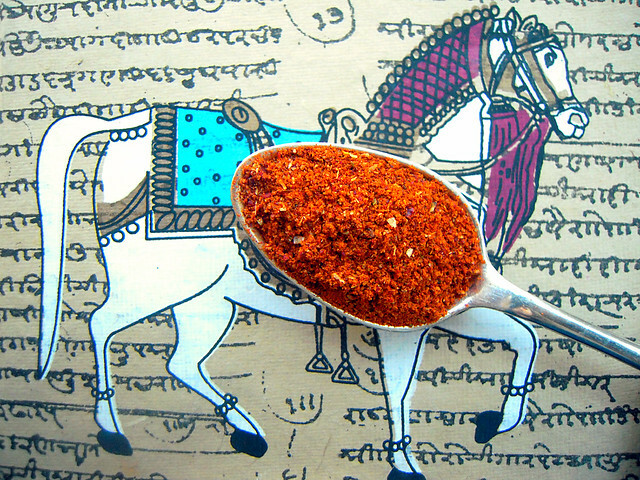 Kashmiri chillies can be found in most Indian groceries, but you have to ask for them. Eastern brand is quite good. Hope you enjoy it, cheers! Hi Abhi, weirdly, yes, I do mean 2 cups, or 500 ml. This recipe actually makes a lot of dal bukhara, almost enough to feed 6 - 8 people, so it uses a fair bit of yogurt. A lot if it cooks down into the sauce, as it thickens. If you don't like the taste of yogurt, I would go with 1 cup yogurt + 1/2 cup cream, which will give you the same, albeit, a less tangier taste. Hope this helps, good luck. Michelle. I just made this last night and though it came out pretty good, the cinnamon was way too intense. Two sticks to start, then 2 inch stick ground up, and then another 1/2 teaspoon for the whole dish was way over the top. Perhaps my cinnamon is stronger? Besides that, everything worked out well! Oh snap! I assume I'm using true cinnamon. I'll be mindful of that in my future cooking! Thanks for the tip! It won't burn at 150 C if you have a oven safe pot and it is covered. If you want to be more cautious, you can reduce the heat to 120 C.
I'm really, really looking forward to giving this recipe a shot because it just looks SO good. I do though have a couple of queries before I start. 1) You give the option of either 1 black cardamom pod (seeds removed) or two green cardamom pods left whole (I'm assuming split, to allow maximum flavour). However, the two have very different flavours - one smokey and the other perfumed. Which would you actually recommend? Secondly, I've only tried grinding black cardamom pods once before and they left my spice mill (albeit only a cheap Sharp model) with a black "plastic" like substance stuck to the plastic of the grinder base extremities - I did grind the seeds as well, so maybe that made a difference? Do you know a way to avoid that happening? 1. Yes, using only the seeds of the black cardamom ensures that the smoky flavour permeates through the dish, as opposed to the darkness of the cardamom taking over. 2. Green cardamom pods are more 'sweeter', but using them whole still adds the cardamom flavour, and a slight smokiness which is not dissimilar to black cardamom. Black cardamom is not always available, which is why I have offered the option of green cardamom. If black is available, I always recommend that. The reason for the plastic like substance is the oil released during the spice grinding process. One way to stop this happening is to let spices cool down completely before grinding to minimise the oil release. Also, try blending in bursts, not letting the blender heat up, and this would also help. I do NOT expect this comment to be "published" but I think it is fair to say that as the "supposed" chef Ms Peters - Jones should be able to answer recipe related queries. This, though, is the second time I have attempted to get her to do this with NO response. I, therefore, am left to contemplate just how much she understands about her subject, rather than the number of words she can type! Great recipe, thank you so much. One query - cups sometimes differ, how many grams of dal would your 2 cups be?